You may also have the same questions as mentioned above. In this guide, we would like to show you detailed steps on how to crop video for Instagram online and offline with different video croppers for Instagram. As a photo and video-sharing social networking service owned by Facebook, Inc., Instagram allows you to upload photos and videos to the service. Instagram offers multiple filters to let you edit uploaded videos and photos, and enables you to organize these uploadings with tags and location information. 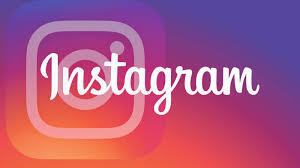 Instagram is available in various platforms, including iOS, Android, Windows 10, Windows 10 Mobile, etc. in 36 different languages. You can share your memories with all your followers and fans anytime anywhere as you like via Instagram. However, there is a limit that Instagram only allows you to upload video up to 60 seconds for sharing. Therefore, sometimes you have to crop or cut video before you could upload them to Instagram. How to crop video for Instagram? Leawo Video Converter would be your best helper. 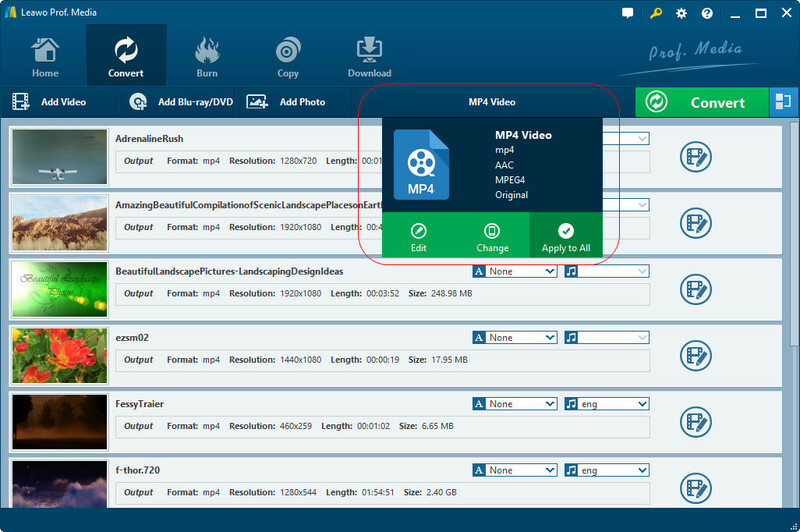 It’s a professional video converter program that could help you convert video files between different formats like MP4, AVI, FLV, WebM, MKV, WMV, etc. What’s more, it has a video editor built in, which enables you to trim and crop video for Instagram. 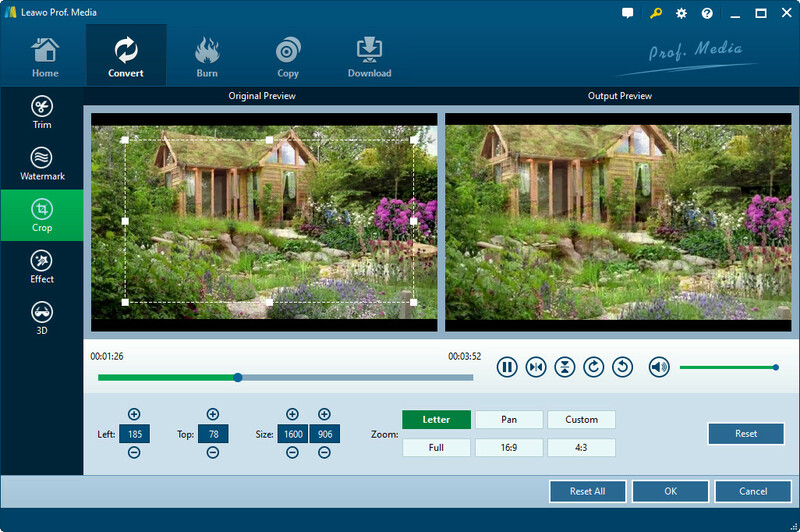 Download and install Leawo Video Converter on your computer (you will find that you’re installing Leawo Prof. Media. 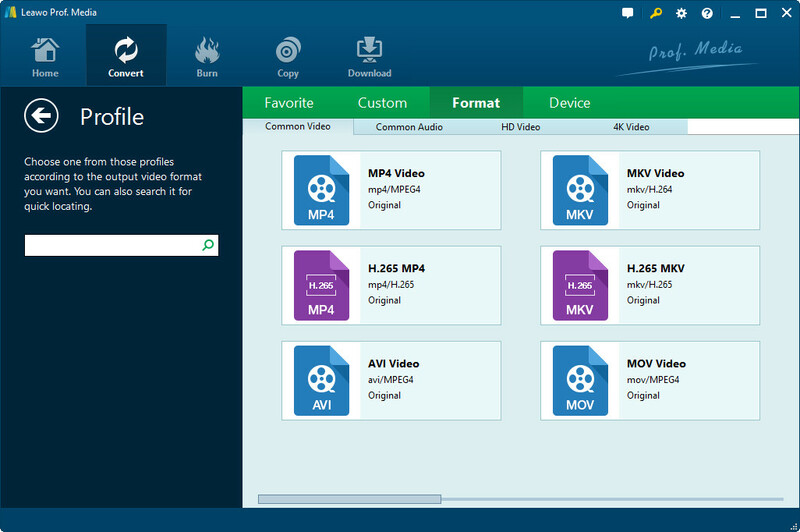 Leawo Video Converter is a function module of Prof. Media). And then launch it. The below steps would show you how to crop video for Instagram. Open the “Convert” module and then click the “Add Video” button to browse and add source video files you want to crop for Instagram. Then, click the drop-down box next to the “Add Photo” button and then choose “Change” option to enter the Profile panel to choose output format. On the Profile panel, choose output format from either “Format” or “Device” group. MP4 Video from “Format > Common Video” is recommended. If you like, you could adjust the parameters of selected profile, including video codec, bit rate, aspect rate, frame rate, audio codec, channel, etc. To do these, reopen the drop-down panel and then choose “Edit” option to enter the “Profile Settings” pane. Now, you need to crop video for Instagram with the internal video editor. Right click the loaded video and then choose “Edit” option to enter the editng panel. Under the “Crop” tab, you could crop video for Instagram to remove black margin. You could do this by directly dragging the dot frame on the left preview panel, or setting the values of “Left” and “Top”. You could also choose a Zoom type before you set these values. On the editing panel, you could also add watermark, apply 3D effect, adjust video effect, remove noise, etc. After cropping video for Instagram, click the “OK” button to return to the main interface. And then click the big green “Convert” button. On the popup sidebar, set output directory in the “Save to” box. The converting would last for a few minutes, depending on the size of source videos and your computer performance. After converting, you could then freely upload cropped videos to Instagram. You could also crop video online for Instagram by using online Instagram video cropper tools, like KAPWING. The below steps would show you how to crop video online for Instagram. Follow the below guide carefully to learn how to crop video online for Instagram with this online video cropper tool. 2. Click the “Upload” button to browse and upload video from local drive. Or you could paste a URL to crop online video for Instagram. 3. After uploading, on the left sidebar, choose “Instagram” option under the “Resize” tab. 4. Under the “Presets”, choose either to “No Crop” or “Crop” option. 5. Set the Background as either “Black” or “White” according to your own preferences. 6. Then, set the Zoom value and adjust the Position on the right panel to crop video for Instagram. 7. After cropping, click the red “Create” button to get final results. 8. Then you will be given a link to download the cropped video for Instagram. Download it. Quite easy it is to crop video online for Instagram. Obviously, you could see that Leawo Video Converter handles multiple video crops at a time, and it offers more practical features to help you upload video to Instagram. 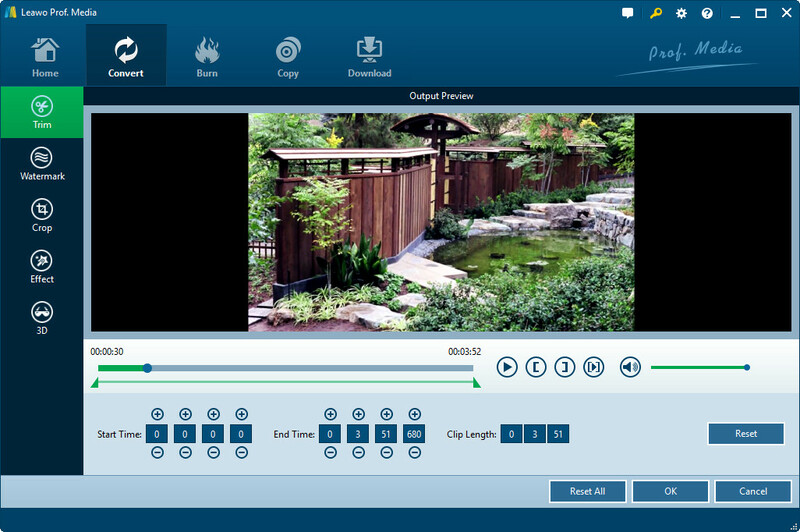 On the other hand, online video cropper tools requires Internet connection, supports little video formats for you to upload videos, and crop a video at a time.